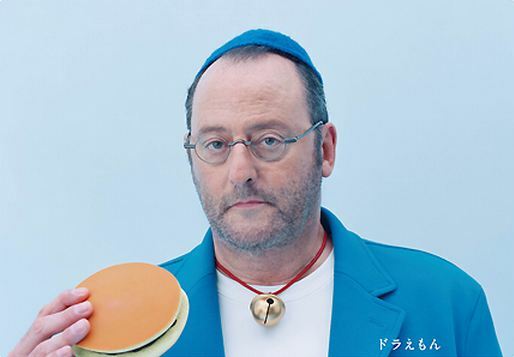 French actor Jean Reno has picked up the role to play� 'Doraemon' for Toyota's new CM! Last week, Toyota released the first-ever live action adaptation of the popular anime, "Doraemon", through their CM, which also stars Tsumabuki Satoshi as 'Nobita' and Ogawa Naoya as 'Gian'. Joining Jean Reno, Yamashita Tomohisa will play 'Suneo' and Mizukawa Asami will play 'Shizuka-chan'. The CM, titled "Nobita no Barbecue", begins with Nobita and Shizuka-chan heading towards a campsite. As expected, they encounter terrible experiences, such as missing the bus and getting lost in the forest. When the two finally reach their destination, Shizuka-chan mutters, "Nobita-san, I have violin lessons...", causing Suneo to say, "Do you want me to take you?" While dangling his keys, Suneo shows off his SUV and teases, "Nobita, why didn't you come in a car... bye!" Left alone, Nobita cries in his room, "I'm so disappointed... If only I had a car~". Doraemon then jumps out of his desk drawer. Immediately, Nobita demands, "Give me a car! ", but Doraemon refuses. When Nobita asks, "Why? ", Doraemon calmly answers, "But you don't have a license." During the CM shoot, the staff had to demonstrate jumping out of a desk in order for Reno to capture the scene. He also had to read a piece of paper that said articulated his Japanese lines a number of times to drive it into his head. Yamashita commented, "I had a lot of fun because I've never experienced such a CM shoot before. First of all, my hairstyle was impressive. As the role of Suneo, I had to promise to keep my hairstyle from any angle it was shot. It was a strange sensation to have the eaves part move according to each cut. Anyway, it was fun." Meanwhile, Mizukawa expressed, "I play the role of the 30-year old Shizuka-chan, so I've matured and become an adult. I wanted to show a side different of Shizuka-chan than when she was a child, so I figured out the way of speaking while consulting with the director on set." Oricon reveals their ranking of "ideal face chosen by men"